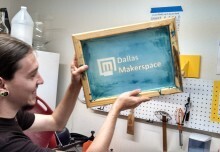 Dallas Makerspace is Building a Beest! Dallas Makerspace (DMS) is making a strandbeest bicycle inspired by Blain Elliot. “What is a strandbeest?” you ask. Strandbeest are the “beach creature” creations of Theo Jansen. Mechanical marvels so lifelike in their actions and reaction to the environment that they took the world by storm. By applying Jansen’s principles to other mechanical devices, we can carry the spirit of these magnificent creatures closer to home. In this case, DMS member Nicole Franczvai assembled a team of interested parties to design, test, and implement the Jansen Linkage leg to provide locomotion to a “bicycle” (technically making it a unicycle with walking legs in the rear providing the locomotion).